LONDON (Reuters) – Dogs took center stage at the premiere of British family comedy “Patrick” on Wednesday with the film’s star pug leading the pack at the canine-friendly screening of the movie. 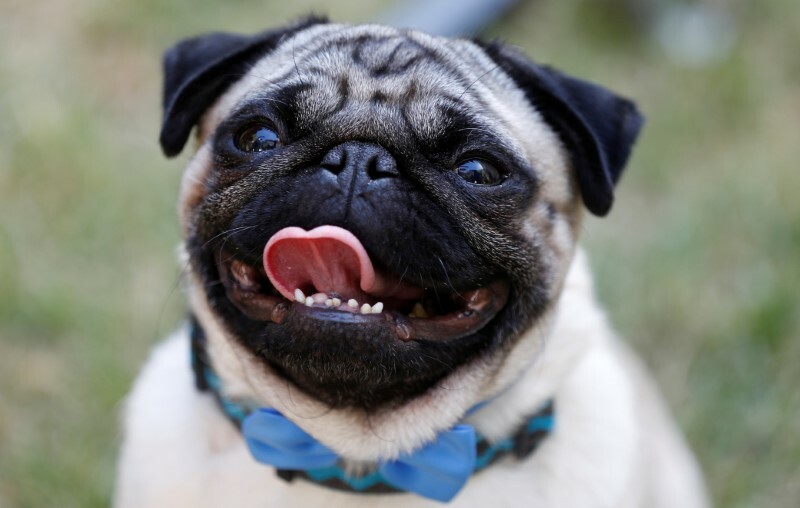 Dressed in a blue bow tie around his collar, pug Harley, who portrays the title character, patiently posed for photographs at the event held in a private London garden, although sometimes he needed the odd treat to stay in a sitting position. Sitting on a small throne as well as posing beside some popcorn and champagne glasses, Harley was quite the star as guests, who brought their own pets, scrambled to get a look at him. The film tells the story of teacher Sarah, played by British actress Beattie Edmondson, who inherits her grandmother’s spoilt pug Patrick. While she struggles with the dog at first, things then start to change and look up for her. “He’s probably the most professional actor I’ve ever worked with. He’s just very like on the mark, always hits his mark, always gets his tricks right, does it in one take,” Edmondson told Reuters of Harley. Harley was joined at the premiere by other pugs, sausage dogs and spaniels among others, some also wearing bow ties or small hats. Most of the canines were on their best behavior before heading into the screening tent. The film’s cast and crew brought their own pets, with Edmondson’s mother, comedienne Jennifer Saunders, who also has a role in the film, posing for pictures with her whippet. Harley gets up to all sorts of tricks in the film and director Mandie Fletcher said she worked closely with his trainer for all his scenes. “When you put it together, it still amazes me how he looks like he’s acting,” she said.